​Hope is being able to see that there is light despite all the darkness. "The Hope Bag was something I could hold as I left prison. Walking out of those doors with something created by the community - it made me feel loved and hopeful even though I was scared." Even in the best of circumstances, transitioning back into society after prison is challenging. An act as small as receiving a Hope Bag – reentry bags that are filled with items intended to support a woman’s first days and weeks post-release so that they can focus on rebuilding their lives – communicates that they are truly cared for and that we are rooting for their success. ​Through the generous support of faith-based and business community partners, the Hope Bags provide an array of toiletries, gift cards and other self-care items along with referrals to community resources and services to help secure employment, housing, transportation, mental health treatment, addiction and recovery services. Please click here and see below to learn how you or your group can sponsor a bag or donate items. Click on this link for our Amazon Hope Bag Wish List for a list of needed items and/or to have items shipped directly to our office. ​Please consider ordering batches of items and having them shipped directly to IPMW's office. Please click on this link to be taken to IPMW's Amazon Hope Bag Wish List. Thank you. *Select IPMW as your recipient organization and when you shop at AmazonSmile, and Amazon donates 0.5% of the purchase price to IPMW. Bookmark the link http://smile.amazon.com/ch/27-0088330 and support us every time you shop at Amazon.com. 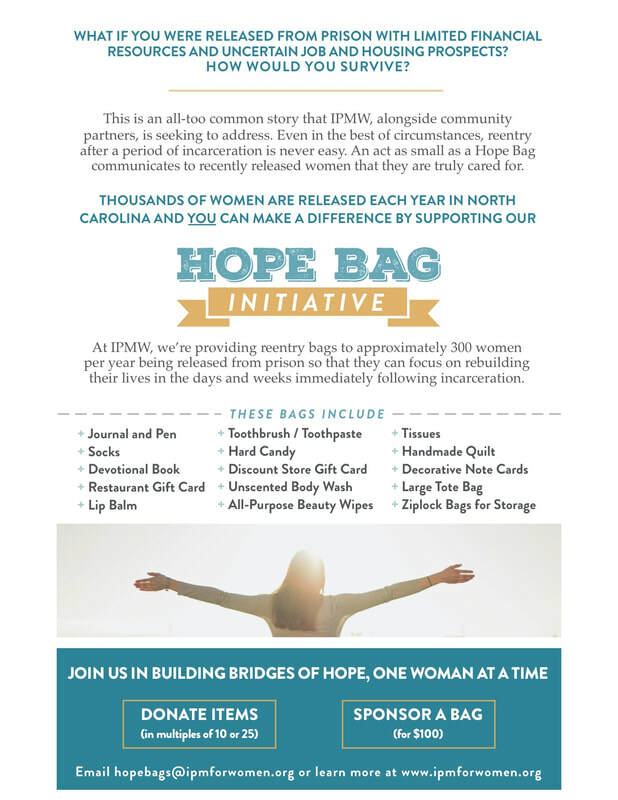 You may contact hopebags@ipmforwomen.org with any questions. Thank you for your consideration and generosity!